Keeping in mind the global need of medical knowledge, sqadia.com follows medical books that are accepted throughout the entire world, so that every medical student can get advantage of the medical lectures made by sqadia.com. The lecture pancreatic neuroendocrine tumors is also designed by following the instructions of the book of internal medicine i.e. ¨Harrison's Principles of Internal Medicine¨. This lecture explains the gastrinomas, insulinomas and glucagonomas, VIPomas, and GRFomas. The lecture pancreatic neuroendocrine tumors initially aims to elaborate the difference between functional and non-functional pNETS. Functional pNETS may present with severe symptoms with a small or undetectable primary tumor, whereas nonfunctional tumors usually present late in the disease course with large tumors, which are frequently metastatic. Treatment of pNETS requires two different strategies. sqadia.com provides all the information regarding the two strategies of treatment in its medical video lecture for the better understanding of medical students as well as for medical practitioners to recall their medical knowledge. Gastrinoma, also known as Zollinger-Ellison syndrome, is NET that secretes gastrin. The diagnosis of gastrinoma requires the demonstration of inappropriate fasting hypergastrinemia. Treatment of gastrinoma is carried out by oral gastric antisecretory drugs, histamine H2-receptor antagonists, and surgical resection. 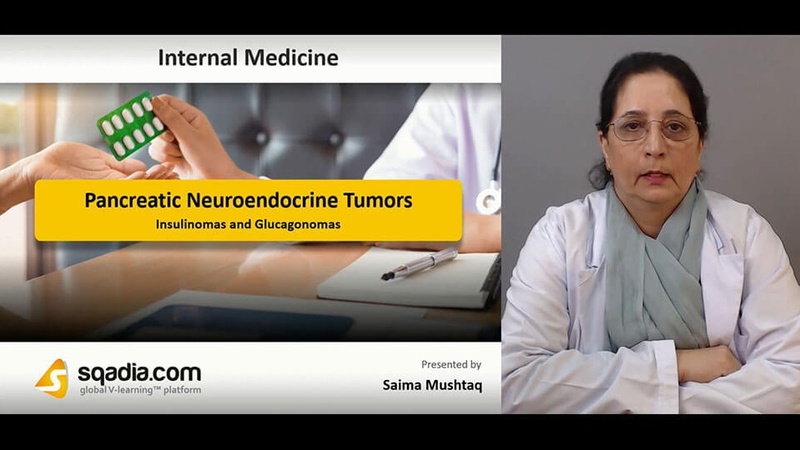 For MBBS students, detailed explanation of insulinomas and glucagonomas is delivered under the lecture title pancreatic neuroendocrine tumors. 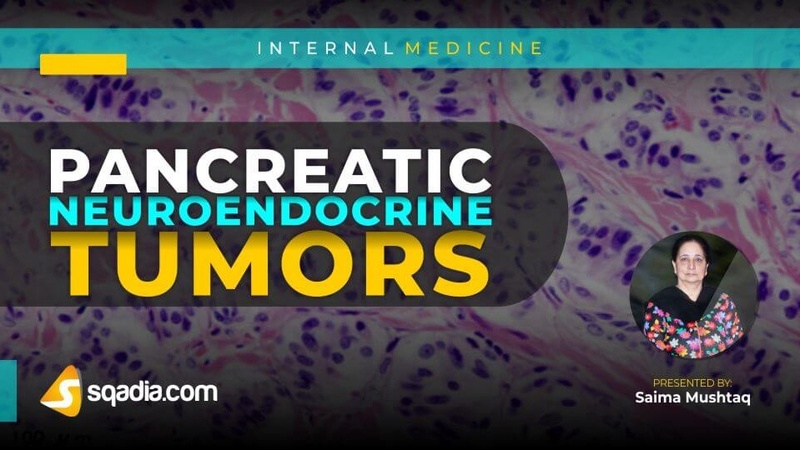 Starting off the section with insulinoma, it is an NET of the pancreas that is thought to be derived from beta cells that ectopically secrete insulin, which results in hypoglycemia. Clinical features of insulinomas are disorientation, coma, and neuroglycemic symptoms. Ther diagnosis of insulinoma requires the demonstration of an elevated plasma insulin level at the time of hypoglycemia. Radioimmunoassays also contribute in diagnosis. Treatment of insulinoma involves surgery, diazoxides intake, hepatic arterial embolization, chemotherapy. A glucagonoma is NET of pancreas that secretes excessive glucagon, which causes distinct syndrome characterized by dermatitis, glucose intolerance or diabetes, and weight loss. Diagnosis of glucagonoma comprises demonstrating glucagon levels, lower levels at diagnosis. Somatostatinoma syndrome is due to an NET that secretes excessive amounts of somatostatin, which causes a distinct syndrome characterized by diarrhea, and steatorrhea. Clinical features of somatostatinoma syndrome include diabetes mellitus, weight loss, hypochlorhydria, gallbladder disease. Somatostatinomas have been diagnosed either at the time of cholecystectomy or during endoscopy. VIPomas are NETs that secrete excessive amounts of vasoactive intestinal peptide (VIP), which causes distinct syndrome characterized by large-volume diarrhea, hypokalemia, and dehydration. Laxatives make diagnosis of VIPomas difficult. For treatment of VIPomas, fluid and electrolyte replacement is carried out. Nonfunctional tumors and GRFomas are enlightened in the medical lecture made by sqadia.com for the ease of medical students by following the medical book ¨Harrison's Principles of Internal Medicine¨. Nonfunctional pancreatic neuroendocrine tumors are NETs that originate in the pancreas and either secrete no products or their products do not cause a specific clinical syndrome. Symptoms of nonfunctional pancreatic neuroendocrine tumors are due to tumor mass which is abdominal pain, jaundice, fatigue, bleeding. The diagnosis is made by histologic confirmation. Treatment of nonfunctional pancreatic neuroendocrine tumors can be carried out through surgical curative resection and laparoscopic approach. GRFomas are NETs that secrete excessive amounts of growth hormone-releasing factor (GRF) that cause acromegaly. Plasma assays for GRF and growth hormones are used for diagnosis of GRFomas. 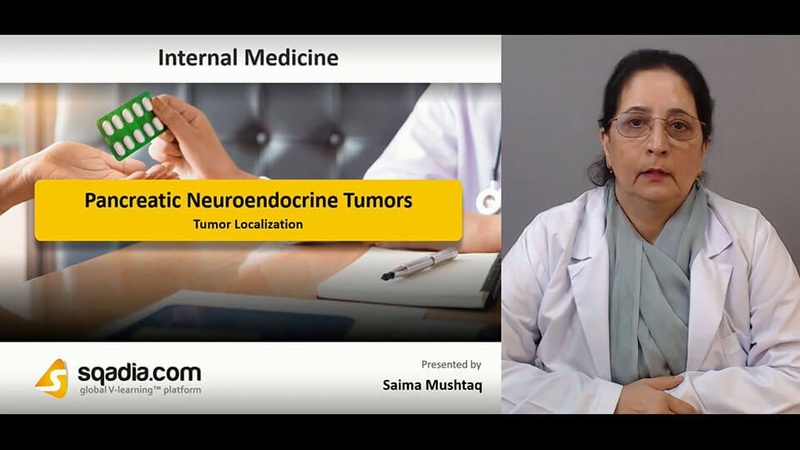 Tumor localization is discussed comprehensively in the medical video lecture at the platform of sqadia.com for medical and MBBS students. Localization of the tumor gives the knowledge whether the patient is a candidate for surgical resection or requires antitumor treatment. Tumor localization methods include cross sectional imaging, selective angiography, positron emission tomography, endoscopic ultrasounds. Treatment of advanced disease such as diffuse metastatic disease is carried out via cytoreductive surgery, radiofrequency ablation, molecular targeted therapy, peptide radioreceptor therapy (PRRT). Specific antitumor treatments involve cytoreductive surgery, long-acting somatostatin analogues, and use of interferon alpha. In peptide receptor radionuclide therapy, radiolabelled somatostatin analogues are used for Targeting of cytotoxic, radiolabelled ligands.